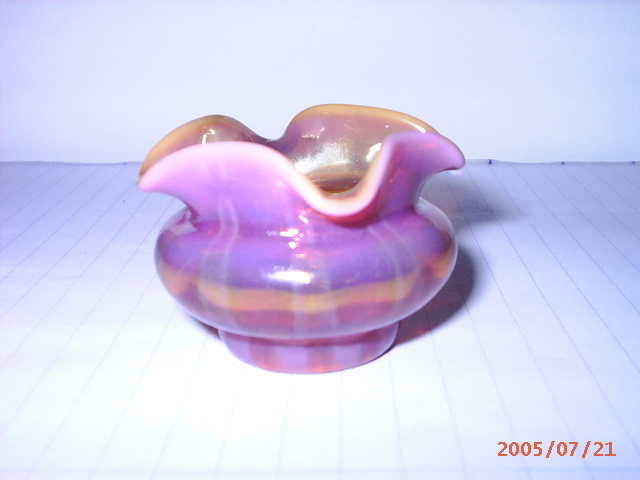 Opalescent vase with stripes, Stourbridge? 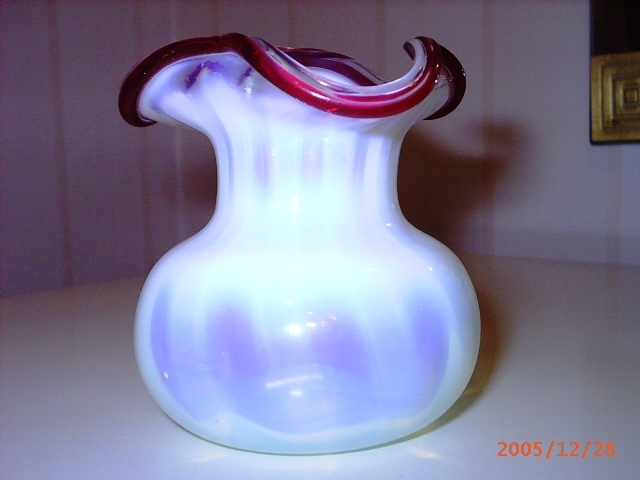 Topic: Opalescent vase with stripes, Stourbridge? I think this could be Richardsons or Webb? Or perhaps American or French? 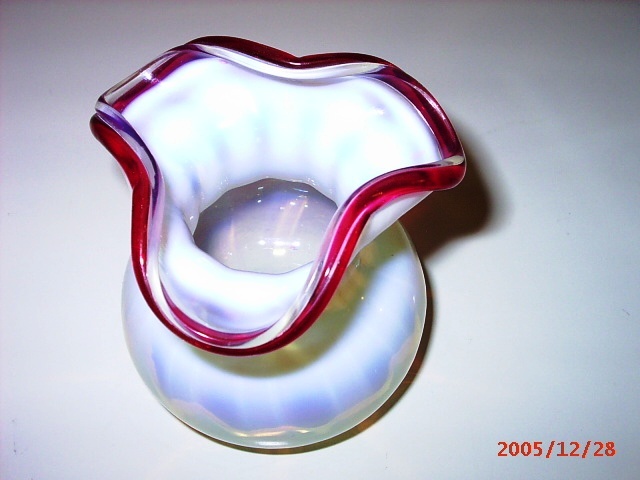 Red glass applied around the rim. Rough pontil mark and plenty of ware to the base. It has a nice orange glow when held up to the light. Thinking back to previous posts, I think this is called a "fire". I've bought a UV light and I'm expecting it to come within a few days now. I did wonder because it has a pale green colour when held up to the light. 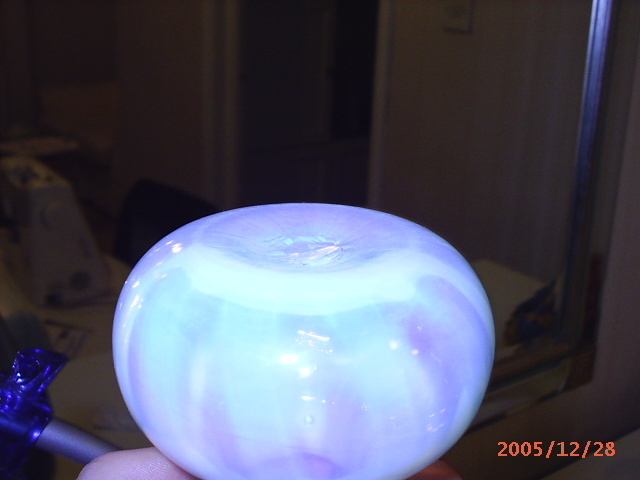 I wasn't sure if that was normal for opalescent glass as I have not owned it before. Don't know who made it but I would say not uranium. You can prove me wrong when your UV light arrives, as mine doesn't work in cyberspace. My UV light has just arrived and the vase doesn't glow green. 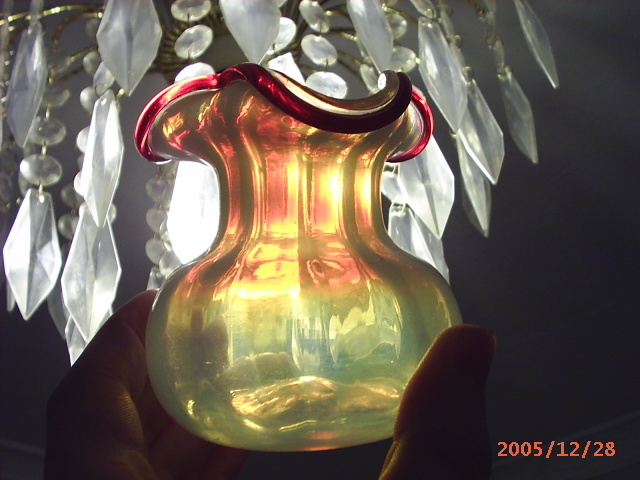 There is a thread in the Murano section where the colour of a milky glass will appear amber-ish when viewed against daylight. I seem to remember that the white pearline in Davidson (et al) glass was also caused by arsenic being included. * Only joking, it is quite safe. Thanks, I wonder if it's French. I originally thought it was a Pantin as it looked a bit like a glass salt I once had. When I compared them together though they look very much different to each other, so failed there. Anyway, I don't think it's that as they only seem to use pinky kind of colours. It has the look of a Stumpf, Touvier and Violette salt I have. In what way does it look like your salt? I think Pantin and Stumpf, Touvier and Violette are sort of the same. So we were on the same track, really. My salt is like Nos. 6035 + 6034 on the above page. (in "others"). I've been googling around but I can only find pink/gold glass and cameo vases. I'm probably barking up the wrong tree. Page created in 0.92 seconds with 28 queries.